The Municipal House or Obecni Dum in Czech is one of the most iconic Art Nouveau buildings in Prague. It contains one of the most celebrated concert venues in the city and a multitude of Instagram worthy restaurants. The Royal Court Palace once stood on this site on Náměstí Republiky. From 1383 until 1485 the Kings and Queens of Bohemia lived on the square beside the Powder Tower, in a magnificent Palace. But after Prague Castle was built, Vladislav II moved the Royal Court out to the newly fortified location and eventually the old Royal Court building was demolished. In 1905, the city started construction on the new Municipal House on the same spot. The building's architects were Osvald Polívka and Antonín Balšánek and to add to the draw of this luxurious building, they hired the best Czech artists working during the time to decorate the interior. 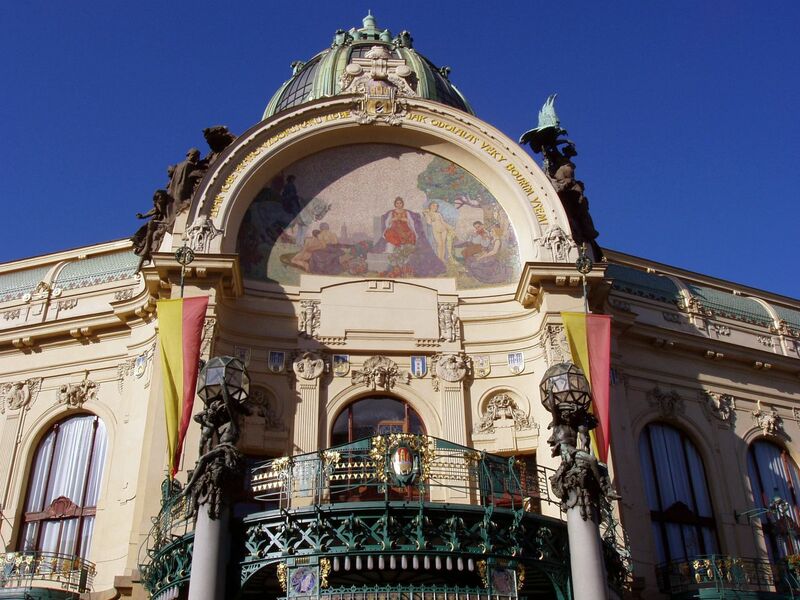 The Municipal House became an icon for Prague's fantastic Art Nouveau architecture. Classical Art Nouveau features included in the building were; asymmetrical shapes, arches and curved forms, curved glass, plant-like embellishments, mosaics, stained glass and Japanese motifs. One of the reasons this building is such a statement is that it was built at the climax of Czech National Architectural Revival. Its popularity was so much so that it was the site of the Czechoslovak declaration of independence on 18 October 1918. Another element of the exterior to examine is the intricate stonework, covered in elaborately carved reliefs, colourful tiles and the eye-catching, bright green domed roof, complete with gold trimmings. The dome also contains one of the finest stained glass ceilings which floods natural light into the concert hall. Along the exterior are curving, leaf-like, green painted iron balconies. These are accented with golden petals and hanging planters. Above the entrance to the building, look up to see a brightly coloured mosaic which was designed by artists Karel Špillar representing the oppression and eventual rebirth of the Czech people. On either side of the mosaic are sculptures by Ladislav Šaloun depicting the goddesses of history, literature, painting, music and architecture. 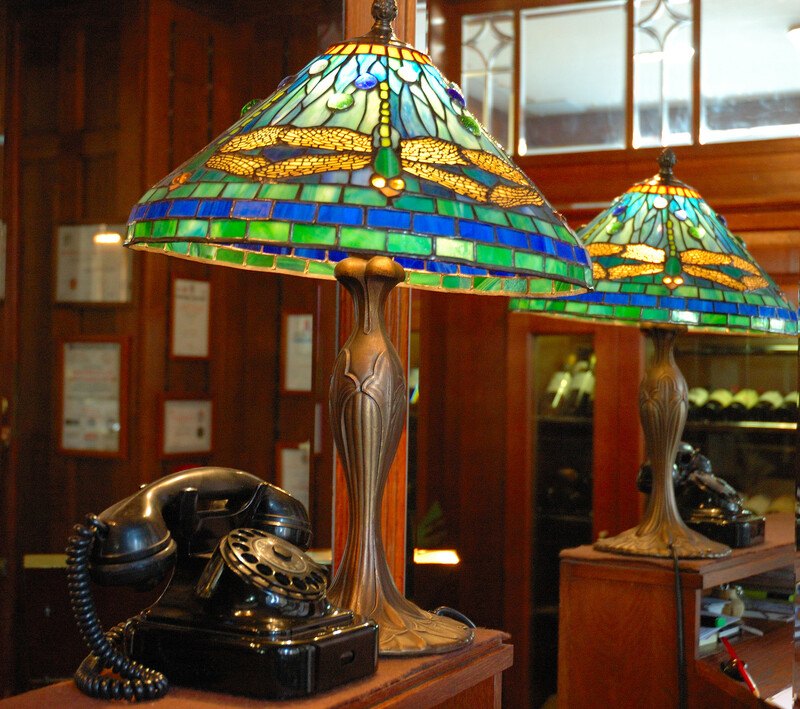 Before you walk inside, you pass under the wrought-iron, stained glass canopy. The small details on this canopy are such a great example of how art nouveau takes every little details and layers on ornamentation to every nook and cranny. Inside the Municipal house, there are so many different places to eat, drink and be entertained. You can eat at an elegant French restaurant, drink pivo at a traditional Czech beer hall, enjoy a slice of cake (or two) at the stylish Czech café, sip cocktails at the 'American Bar' or attend a first-class concert at the fabulous Grand Concert Hall. Inside the entry, take a moment study the walls. They are painted with reliefs by Alphonse Mucha. Although you can view Mucha paintings at the Mucha Museum, there is something about seeing these pieces in situ that makes them all the more impactful. These painted figures are all from Czech history and mythology. They represent the civic virtues, most notably exemplified by Jan Hus as Spravedlnost (Justice), Jan Žižka as Bojovnost (Military Prowess) and the Chodové (a Medieval guard) as beady-eyed Ostražitost (Vigilance). If you wish to get to the concert hall, head up the sumptuous marble staircase. 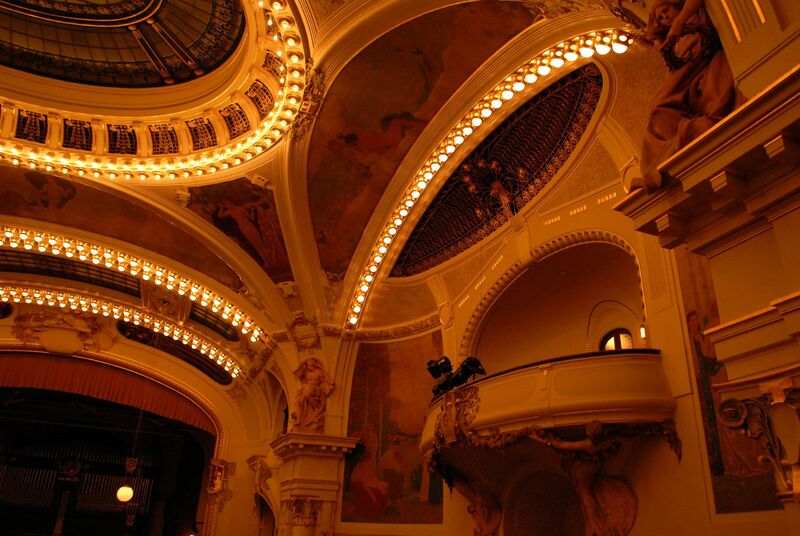 The Smetana Concert Hall and Ballroom is located right under the magnificent glass dome. Inside this room, you'll find pieces of art work by Alfonse Mucha, Jan Preisler and Max Švabinský decorating the ceilings and walls. The interior of the concert hall is covered in white stone and gold filigree. The entire theatre is illuminated by hundreds of tiny lights, casting a gentle glow upon the people below. The stage is framed by arcing sculptures depicting Vyšehrad legends and Slavic dances. 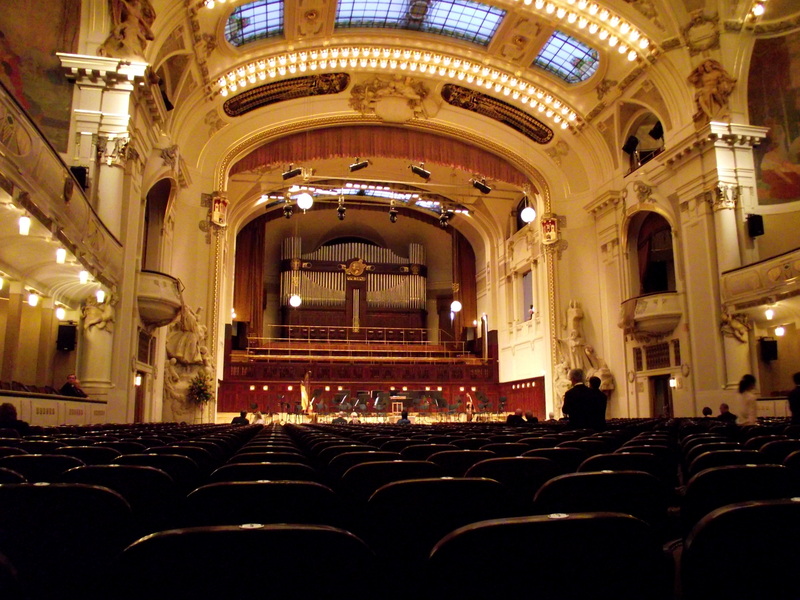 The concert hall plays hosts to a multitude of musicians and plays and is the home to the Czech National Symphony Orchestra. 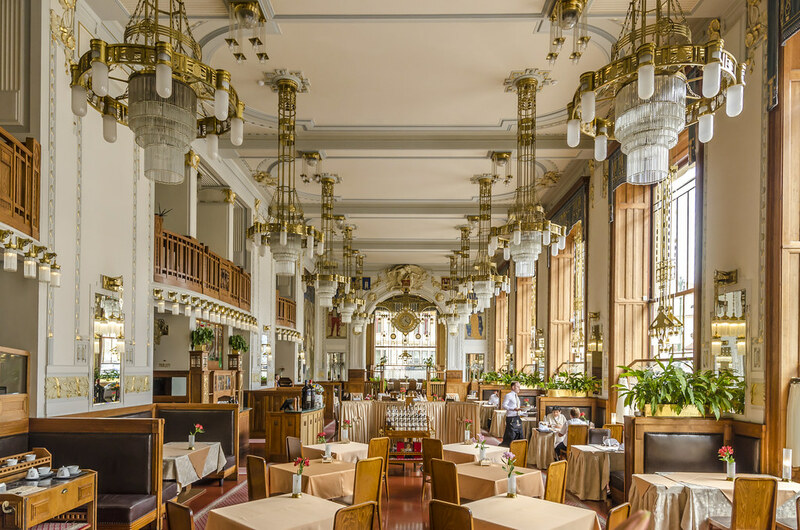 If you don't have time for a concert but are longing to enjoy the elegant art nouveau environment, go downstairs and choose from one of the many dining options. The Francouzska Restaurant is one of the finest culinary experience you can have in Prague. Golden art nouveau inspired chandelier pour off the ceiling. The furnishings all throughout the restaurants are originally from the beginning of the 1920's, and even the silverware period perfect. The walls are covered by some of the finest paintings by Alphonse Mucha. Stucco works in geometric patterns adorns the walls. Dining here is like entering a living museum. But a restaurant this beautiful comes with a price. If you aren't dining here, you can barely peek your head inside to take a picture, so if you can afford it, it is a wonderfully private and unique experience. 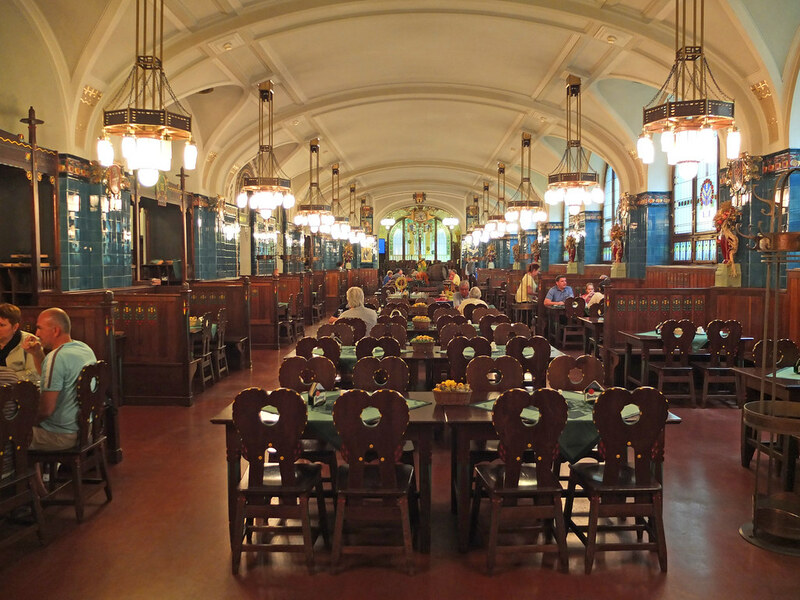 The Plzenska Restaurant, which is on the lower level, is a slightly more affordable option. 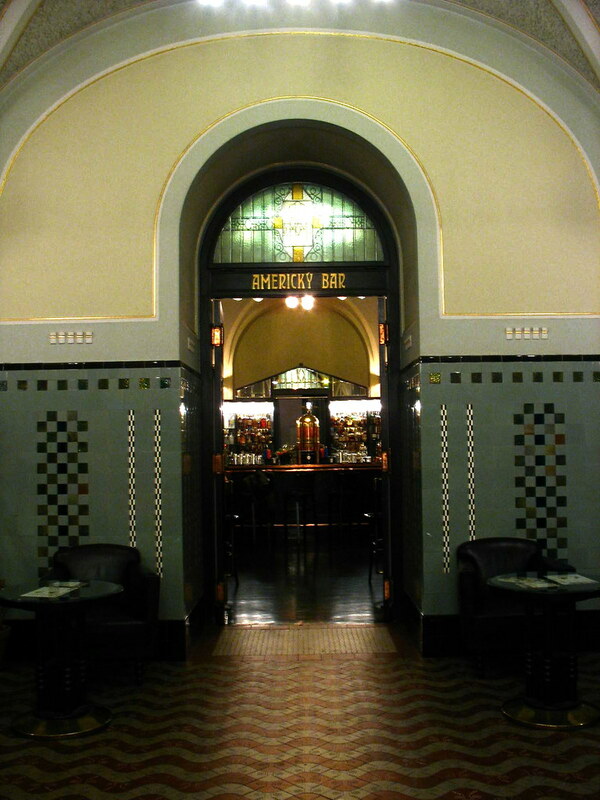 It is famous for its traditional Czech cuisine and friendly beer hall atmosphere. I think this is truly the best beer hall in the entirety of Prague. It is stunning to look at while also comfortably casual. There is something about the brightly coloured blue tiles set against the rich oak panels and the simple, yet elegant, stained glass windows that make you feel like you've been invited into someone's prized dining room. The food here is also impeccable. If you have yet to sample any classic Czech meal, this is the perfect place to do so. Also in the basement is the black and white marbled "American Bar". Here you can get a well-made cocktail or spirit and enjoy the swish atmosphere of a 1940's salon. 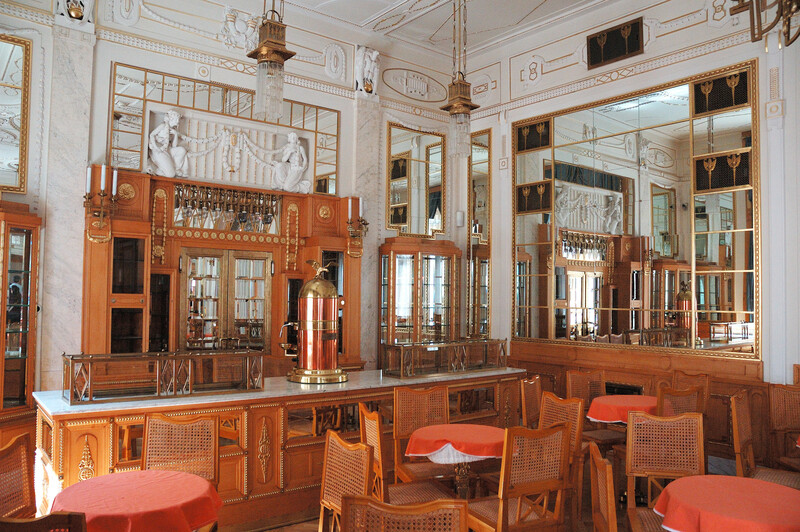 To finish off your night at the Municipal house, wander into the Kavárna Obecní dům café, on the ground floor. This cafe is considered to be one of the best in the world. Although they are most famous for their desserts, this is also a great place to grab a bite to eat, if you're looking for a reasonable meal at a reasonable price. It's open late, so it's a great option to grab that last coffee before heading out for a night on the town, or a night cap to drink before going to bed (which is more my speed). During the summer time, the garden out front is a beautiful place to people watch and sip a coffee early in the morning while the locals are off to work. Although the dinners are well made, their sweet treats are where they really shine. Homemade cakes make the rounds in glass trolleys so you can see the goods before you buy. Their cream cake with fresh berries is a charming creation that will satisfy any palette. The Kavárna Obecní dům café is also where I got to try my first "Bitter Rose Lemonade" which is by far my favourite non-alcoholic Czech beverage. I know it might not be a traditional Czech drink, but I have only found it in Prague, and anytime I think back to my time there I remember the sweet smell of fizzy roses. 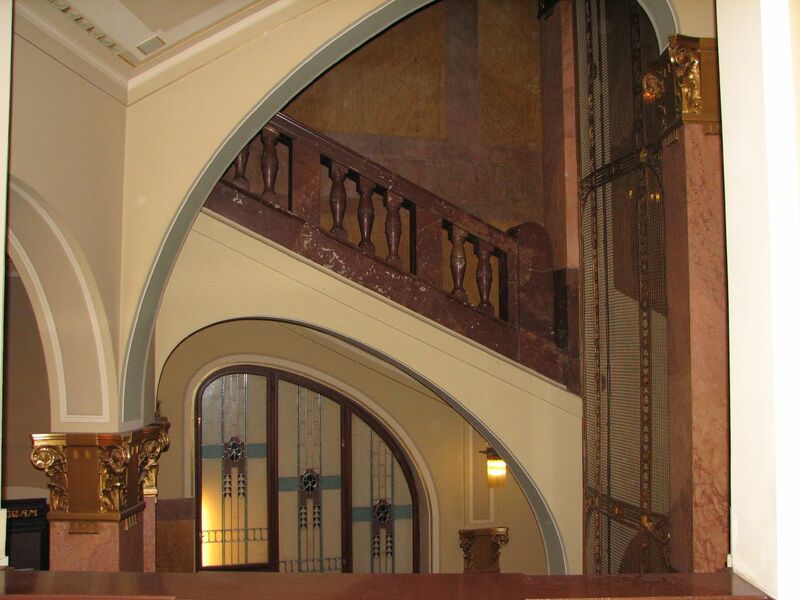 Guided Tours are available of the Municipal House at the cost of 290 CZK per adult. The tours are in English and Czech language; printed versions of the commentary are available in German, French, Italian, Spanish, Japanese and Russian. 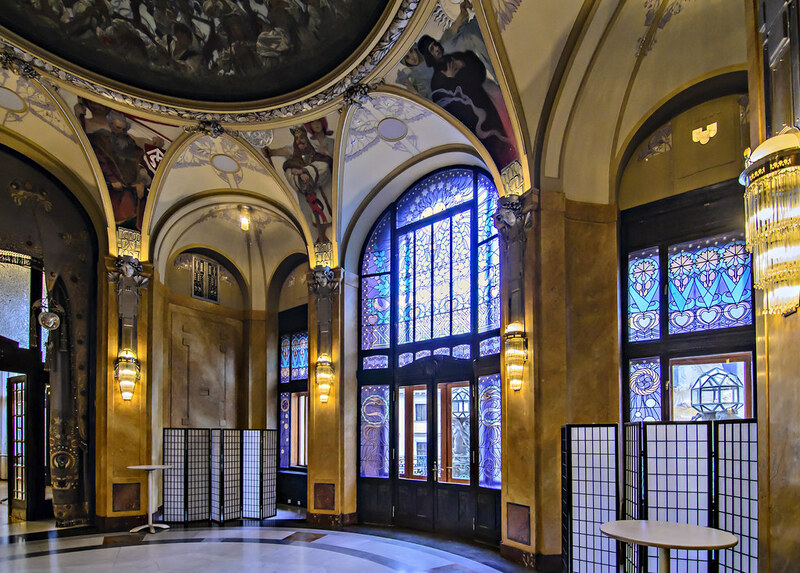 The tours take approximately an hour and are a great way to learn a little bit more about the building if you're interested in this Czech Art Nouveau masterpiece. The guided tours are only offered on certain days throughout the year so check the website for more information.